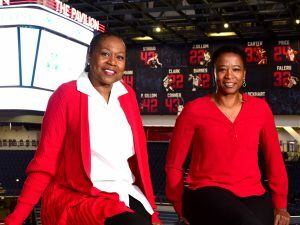 Legendary University of Mississippi women’s basketball stars Jennifer Gillom and Peggie Gillom-Granderson will be honored with the 2017 Legacy Award from the Ole Miss Women’s Council for Philanthropy (OMWC). An awards presentation and dinner will be hosted April 22 at The Pavilion at Ole Miss. C Spire – a diversified telecommunications and technology services company and the nation’s largest privately held wireless provider – will again be the Presenting Sponsor for the event. The awards presentation will feature entertainment and tributes to Gillom and Gillom-Granderson. A sponsor’s gala reception begins at 6 p.m., followed by a seated dinner at 7 p.m.
Gillom is no stranger to success. The Abbeville, Mississippi, native has an impressive resume of awards, medals and accolades earned throughout her athletic career. While she played basketball for the Ole Miss Lady Rebels from 1982 to 1986, she was awarded SEC Female Athlete of the Year and other major distinctions. Not only did Gillom lead her team to victory time and again, she also made Ole Miss history, becoming the second-highest scorer and third-highest rebounder. Gillom went on to play professionally for the Phoenix Mercury from 1997 to 2002 and also for international teams in Italy, Turkey and Greece. She then coached in the WNBA for seven years and earned gold medals in the 1988 Olympics as a player and in the 2012 Olympics as the coach of Team USA. The university honored her achievements by inducting her into the Ole Miss Athletics Hall of Fame in 1999. In 2009 she was inducted into the Women’s Basketball Hall of Fame. Gillom-Granderson still holds the record as the all-time leading scorer and rebounder at her alma mater. She was a member of the Lady Rebels from 1976 to 1980. After graduation, she went on to play for the Dallas Diamonds in 1980, then coached in the WNBA, before returning to Ole Miss to coach from 1981 to 1997. Gillom-Granderson also coached the Houston Comets in 1997 to 1999, which saw the team win the WNBA championship both years. From 1999 to 2003, she was a head coach at Texas A&M University and served as assistant coach for Team USA in the 2000 Olympics, leading the team to capture gold. She returned to her alma mater in 2003 to help coach the Lady Rebels basketball team until her 2009 retirement. She now serves as the Fellowship of Christian Athletes’ Women’s Chaplain at Ole Miss. Gillom-Granderson was inducted to the Ole Miss Athletics Hall of Fame in 1996, Mississippi Sports Hall of Fame in 1997 and the Women’s Basketball Hall of Fame in 2013. Most recently she received the 2015 Nathaniel Northington Groundbreaker in Athletics Award. “We are so excited to be presenting this award to these two incredibly deserving women and sisters who have built a legacy of achievement at Ole Miss,” says Olivia Manning of New Orleans, Louisiana, a past award recipient, “These ladies went on to accomplish so much after their time here at Ole Miss, playing in the WNBA and Olympics. I think it’s important to pay tribute to our alumni who have accomplished so much not just here at Ole Miss but also around the world. Established in 2000, by a group of female leaders and philanthropists, the OMWC nurtures the development of students who have the potential to graduate and improve their communities through leadership. Council members promote philanthropy in order to sponsor innovative programs that attract and develop students through leadership, scholarship, mentoring and cultural experiences. A total of 109 students, including 23 now enrolled, have benefited from the innovative OMWC program. On the eve of the Legacy Award presentation, all event sponsors and Rose Society members will be recognized at a casual dinner hosted by the Women’s Council on the patio between The Pavilion and Vaught-Hemingway Stadium. Sponsorships, preferred tables and individual tickets are available for this event that traditionally is a sellout. For information concerning sponsorships, tickets or Rose Society membership, contact Nora Capwell with the OMWC at 662-915-2384 or ncapwell@olemiss.edu. Information also is available online at www.omwc.olemiss.edu/legacy.